Wars with religious undertones have occurred over recorded human history. Many of these conflicts have been characterized by acts of significant brutality, recorded all-too-frequently by chroniclers as “putting the population to the sword.” Today, these shocking accounts have morphed from the pages of history text to graphic beheadings and burning to death on videos on the internet. The Peace of Westphalia signed in 1648 resolved the Thirty Years’ War, one of the longest and most destructive conflicts in European history – and initially a war between Christian Protestant and Christian Catholic states in the fragmenting Holy Roman Empire. Christians continued to brutally fight one another, most recently evident in the civil wars in Ireland and Northern Ireland. Islamic factions – Sunni and Shia – have fought each other almost from the start of Islam and continue to this day. Finally, the era of the Crusades (1095-1285) demonstrated the ferocity of Christian-Muslim conflict. Western historians seem to fall into three categories concerning the character of this two-century medieval clash: some see the Crusades as part of a purely defensive war against Islamic conquest; others view the struggle as part of long-running conflict at the frontiers of Europe; a third tranche has concluded that the wars were caused by aggressive, papal-led expansion attempts by Western Christendom. Muslim historians – and more importantly the average Muslim man or woman on the street – have quite a different view. As far as the Muslims in the Middle East during those two centuries believed, the Crusades were simply the latest stage in Frankish imperialism that had already manifested itself in North Africa, Sicily and Spain. However, what is most important is not what Christians and Muslims thought 800 years ago, but how they continue to view these events today. The Christian West has quite simply forgotten the Crusades. They are an event that happened, but not one that still elicits emotion. Almost no Christian holds a public grudge that a distant relation fighting in the Crusades was killed by Muslims. In short, there is no utility in modern western life to be concerned with just another increasingly distant chapter in a dusty history book. The opposite occurred in the Muslim world. Initially – at the time of these events – Muslim scholars believed that there was nothing of value to learn from the Christian/Frankish barbarians who came from Central and Western Europe. Not only were Muslim historians uninterested in what Christians did, there were also indifferent to what Christians thought. Muslim feelings – in the exact obverse of Christian views – seem to be more concerned with the Crusades today than they were in the centuries immediately following the wars. Today, Muslims recall the Crusades as an offensive Christian undertaking with one or more goals of: humiliating Islam; defeating Islam; eradicating Islam. The Muslim view of the Crusades is that it is the wound that will not heal; it is original sin that no Christian may wash away. Relations between Islam and Christianity did not improve to a brotherly love level over the last several hundred years, but for the most part did not involve attempting to destroy the other en mass, although periodic religious wars in the Balkans were certainly extremely violent. However, the fire between Islam and Christianity/Judaism rekindled with the establishment of the State of Israel on May 14, 1948. In fact, one could easily argue that the current war by militant Islam against Christianity and Judaism – now 66 years old – began on this date. It has become popular to attribute current unrest in the Mideast to a lack of good governance by many nation states in the region (i.e. lack of adequate health care, rampant corruption, inability to protect citizens from crime, substandard education, lack of jobs, etc.) While problems in good governance certainly are a contributory factor, they are not the root cause of the violence. England has good governance and they have a large number of jihadists, and it is becoming evident that so does the United States. The root cause of the death and destruction throughout an alarmingly high proportion of the Muslim world are the beliefs of a substantial number of the faithful that the Qur’an (Koran) calls on them to subjugate and kill non-Muslims as part of the expansion of Islamic faith and culture. The idea of fighting for God, although not confined to Islam, has given service in Muslim terrorist organizations a special attraction, which leads to a discussion of the Center of Gravity of ISIS, Al Qaeda and all other militant Muslim groups, regardless of their name or home location. For our purposes, let us define militant Islam as either Muslim nation-state sponsored terrorism or non-nation state terrorism, directed at non-Muslim targets. Muslim on Muslim violence (Shia-Sunni) is certainly violent, but it is something a little different. Prussian military strategist, Carl von Clausewitz, believed that a fundamental requirement in war was to identify the enemy’s Center of Gravity and attack it vigorously. He stated in part, “the force at which our blow is to be aimed requires that our strength be concentrated to the utmost… therefore a major act of strategic judgment to distinguish these centers of gravity in the enemy’s forces and to identify their spheres of effectiveness.” This center of gravity, be it the bulk of the enemy’s army or other capability (although seldom an enemy leader), is the hub of all power and strength. Destroy it and the enemy collapses. 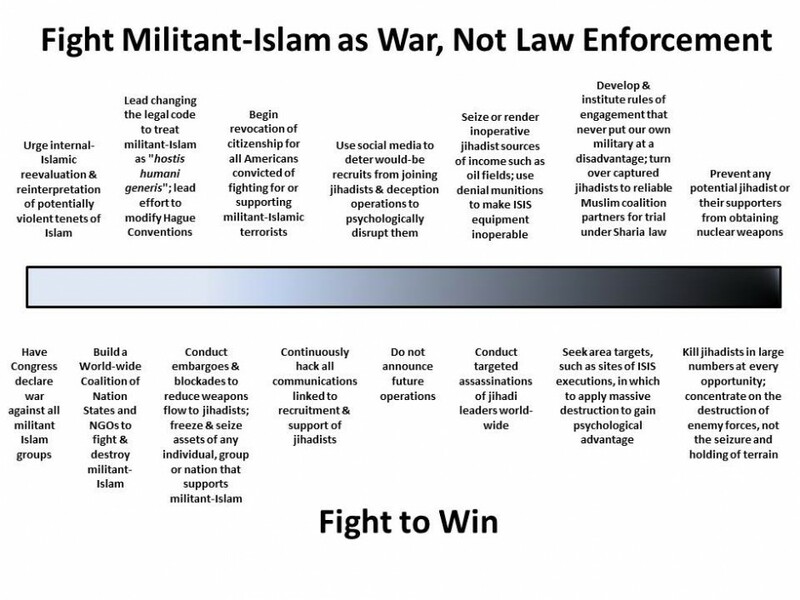 It is this paper’s opinion that the strategic center of gravity of every militant Islamic organization, from small terrorist cells to large conventionally formed and equipped armies, is the magnetism of certain tenants of Islam that attract an almost inexhaustible number of recruits that are prepared to do violence to non-believers and even die for their cause in their quest to expand their religion into a caliphate under Islamic law. Attacking this strategic center of gravity is a multi-faceted process. Over the long term, these select violent tenants of Islam must be “demagnetized” in an effort by which they lose their appeal to potential recruits. It will be a complex process, as we must create the conditions in which they will convince themselves that violence is not the answer. A second way to attack this hub of all power, which should begin immediately, is to simply kill the jihadists in as large numbers as possible. Unfortunately, that brutal solution may extend to succeeding generations seeking to emulate their elders, if these young jihadist “wannabees” cannot be convinced to drop the sword. However, there is an additional course of action to only killing current jihadists and that is in the realm of psychological warfare. We must discover that which frightens the jihadist. What causes him to wake up in the middle of the night screaming in terror? Most religions and cultures have their own boogie men, infant-snatchers and vampire lore; how can we use these legends to psychologically dislocate the jihadists and their core supporters? We must additionally separate the foot-soldier jihadists from their leaders. Our information campaign must create the story that the sons of these leaders rarely become suicide bombers (that is only for the lesser value men) and that the leaders often skim millions of dollars of wealth from the cause for their own personal benefit. More importantly, we must study with responsible Imams those terrorist acts that will cause the jihadist to be “excommunicated” from the faith and that there is no heaven for these men – and ensure that information is widely disseminated, if only to peel away some of the less-radical foot soldiers. Not all jihadist groups are created equal and we must prioritize the levels of danger presented by each. Concerning the current iteration of the Islamic State of Iraq and the Levant (ISIS/ISIL), the center of gravity at the operational level is the group’s ability to generate significant funds to procure weapons, supplies and influence; the group is thought to have at least $2 billion and the sum is growing daily. Whether this is destroying or capturing oilfields under ISIS control, hacking into ISIS financial accounts or closing the flow of the Hawala money transfer system, it is imperative that ISIS be deprived of significant funding. This is because the leaders in militant Islam understand that while they can use a strategy of attrition to possibly defeat U.S. and western forces operating in the Middle East (and thus wearing down the American home front with seemingly endless casualties) – ISIS needs nuclear weapons to truly go on the offensive and actually expand the caliphate. This means purchasing such weapons, as ISIS does not have the scientific or technical ability to make their own. Make no mistake; when terrorists, with an end of days’ Yawm al-Qiyāmah philosophy, obtain nuclear weapons, it is only a matter of time before they gladly use them. Unfortunately, this current war may well last into the next century. This is because breaking the magnetism of those violent tenants of Islam will require a Muslim “reformation,” whatever that looks like, powerful Fatwas and active dissuasion of violence from “the pulpit.” Islam must go through a self-generated process to eliminate the violent portions of its theology, while at the same time healing the rift between Sunnis and Shiites and that will take time – decades at the least. To begin a strategic campaign, we must first be able to identify the enemy in order to tailor a strategy that will be successful. Militant Islam is not workplace violence; it is not a tiny minority unsupported by the vast majority of Muslims. Militant Islam cannot co-exist. It is not primarily a law enforcement issue; it is war. At the current time, militant Islamic prisoners of war cannot be reliably “cured” of violent tendencies; they are killing machines. That is why terms such as degrade are imprecise and dangerous. Despite the protestations of the barstool brigadiers and armchair admirals that never fired a shot in anger, the nature of war is violence and the character and conduct of this war will also be violent. It is no coincidence that Islam never spread northeast. In 1219, Genghis Khan invaded Khwarezmia, which was governed by Shah Ala ad-Din Muhammad, and during the conquest killed millions of people across the land. The Mongol adversaries took a back seat to no one in their application of violence and Islam never forgot. In most wars, the victor actually does kill his way out of it, inflicting so much pain on the enemy that the opponent surrenders or agrees to terms. The second objective of this initial strategic campaign is not to lose before we have marshalled the will and resources to win. There are four conditions that could cause a situation that would preclude ultimate victory. The United States loses if it simply quits the fight and withdraws inward, sustains a significant weapon of mass destruction (WMD) attack that puts the national economy in peril, fails to support Israel to such a degree that Israel is destroyed, or seeks to accommodate the tenants of militant Islam such as Sharia Law. The current administration may feel that it does not have the time left or the stomach to do what must be done offensively. However, it can still make a contribution defensively: to protect the country from a WMD attack over the next two years, by first stopping the proliferation of nuclear weapons. The next administration and the next generation of political leaders have their own roles to play and will have to ramp up the struggle. First, both major political parties must go against their own petty self-interests and work to unify the country as one. Second, taking counsel of sound senior military advice, they must rebuild the U.S. military to provide those capabilities that will prove successful in the fight – such as an even greater increase in special operations forces and intelligence gathering capabilities. Both support the operational Center of Gravity of the United States military – the ability to quickly and accurately place overwhelming fires anywhere in the world on land, sea and air across the spectrum of conflict. Finally, as we contemplate a lengthy war, we must consider the composition of the military. The nation made a mistake after Nine-Eleven and did not implement actions to elicit shared sacrifice from our population. The last dozen years of war have been fought by the volunteer professional military, often described as the one-half of one percent. Nothing like the old Victory-Bond drives came into being after that fateful September morning. No special war taxes were implemented. No common, shared sacrifice was demanded. To a great degree, the conflict has been fought with a very small tip of the spear, albeit a razor-sharp one. The nation needs to debate returning to a draft. We currently have numerous ethnic and racial groups that have little contact with or understanding of other groups; this leads to senseless mistrust and disunity. Societal evolution has led to many children raised in one-parent families and having no sense of either authority or of the collective good. Militant gangs replace absent fathers. Violence on America’s streets is rampant; Chicago, based on dozens of gang-related shootings every weekend, has acquired the new deadly moniker of “Chiraq” and this viciousness is not confined to large cities. Returning to the draft – and this does not mean deploying draftees overseas to fight jihadists; the character of the conflict is such that we can do that with a professional core – would produce shorter-term soldiers, who can assist with natural disasters at home, guard the borders of the country and ensure that all Americans have a stake in the outcome of the war. Equally important, we might be able to save what is appearing to be a lost generation. We must contemplate unpleasant measures if we are to defeat an enemy that is as brutal and tenacious as militant Islam. CIA estimates go as high as 31,000 active enemy fighters, while Kurdish sources put the number at 200,000. On the legal front, we must engage the international law system to emplace laws that take away as many human rights of terrorists as possible; we should attempt to deny the terrorists all rights under the Geneva Conventions. Given that on the battlefield jihadists often pretend to surrender only to attack when our guard is lowered, that we are often loath to use the death penalty in judicial proceedings, that terrorists recruit new terrorists in prison and that released terrorists from Guantanamo confinement are likely to return to violence, we must examine our own procedures and rules to determine when it is simply too dangerous to capture them. We should also contemplate closing confinement facilities, not because of the tired arguments that these centers serve as recruitment propaganda, but rather that the prisoners in them remain in the public eye. They write letters; they are potential bargaining chips such as the five Taliban leaders that were released at the stroke of a pen in 2014. We need to develop a system where uncertainty creeps into the minds of the terrorists. We should never return the remains of deceased terrorists to their relatives; in fact, we should never confirm what has happened or not happened to them when they disappear from the battlefield. We should not even give them a Muslim burial or place them in marked graves; their brutal acts caused them to forfeit that consideration (we did that with executed Nazi war criminals.) Additionally, since it is only a matter of time before the terrorists figure out how to create biological suicide “bombers” infected with Ebola, Small Pox or other deadly contagious diseases, we should assume that every dead terrorist is already infected and his remains should be handled accordingly. 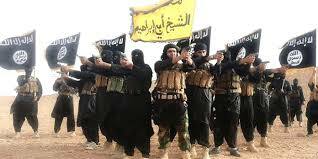 ISIS/ISIL and Al Qaeda, left to their own devices, became killing machines. It will take a superior killing machine to drive home the terrible conclusion to every jihadist and every jihadist-supporter that there will be no glory in murdering innocents and no glory in dying for a hateful God. There will be no jail cell or halfway house, from which they might someday be released, for the purveyors of evil. There will only be a certain, agonizing, lonely, pointless death in the shadows of darkness in a manner that precludes even their memory from being cherished by their family and friends…their entire corporal and spiritual self will simply disappear for all time.